Camille Hart, a local St. Martinville resident and LSU literature student recently had the opportunity to sit down with Joel, a fellow band mate and friend of Gavin Devereaux (a life-long resident of New Iberia and local musician) to interview him about their latest charity album collaboration. The interview will be featured in the music section of the upcoming issue of LSU’s publication, The Daily Reveille. The following are her observations and her account. Joel’s in town from London to play with Gavin at Cafe Des Amis, so he agreed to meet me at my place for the interview. He strolled right into my house and popped on a Johnny Cash record, lit up a smoke and plopped his guitar over his lap. He seems relaxed in his skin, warm, and has all kinds of interesting tattoos. I could get used to having this guy around. His smile and easygoing attitude are infectious. I sit down next to him with my journal and coffee, feeling like I’m meeting with a long lost friend. I offer him some coffee—he declines—and start the interview. How was it working with Gavin on this album? He’s a self-admitted recluse, but he seems in his element when it comes to music, pretty social in the local scene. How long have you two played together? Sorry, hon. (takes another drag off his cigarette) Uptight much? Camille. The name’s Camille. Anyway, so how did you and Gavin go about collaborating on the album? And how do you feel about the Duval Foundation and all the different charities he’s decided to donate the proceeds to? Did you have any say in that? Yeah, I did. I chose a few charities to add to the foundation’s list, one in particular that helps fund and support worldwide literacy efforts, and another that helps homeless youth just outside of London. But he chose most of the organizations and I support his selection 100%. As for getting together to work on the album, Gavin and another friend of ours, Gabe, called me up and wanted to see if I’d be interested in playing guitar for a couple of tracks. I told them I was in and the album was done a few months later. I’m happy to be a part of it. So, it sounds like you’re all good friends and had fun working on this together. You live in London, but will you be playing live with Gavin and Gabe here in Louisiana the night of the release party? As it stands, you can count on me being here. It’s only a hop across the Atlantic, so I’m happy to make it and help out. Gavin and Gabe are like brothers to me, and I wouldn’t miss. That’s a big hop. Well, I’m sure it means a lot to Gavin. I interviewed him the other day and he spoke so highly of you. He mentioned you love to read. Do you draw any musical inspiration from your favorite books? Don’t you work at a bookstore? But what about the interview? It won’t take me long to finish my questions. Gave in and headed to the bookstore with him. Resumed the interview later that night back at my place. He insisted on cooking me dinner while I finished the questioning, complaining he never has anyone to cook for back in London. He wore my floral apron while he basted the chicken—that was a sight. He also offered me a free flight to London when I told him I couldn’t afford an airline ticket anytime soon. Will be taking him up on that. 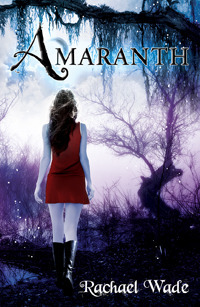 Amaranth, Book One of The Resistance Trilogy is available now in e-book from Amazon and Barnes and Noble. Available in print Sept. 30th. Read Camille’s interview with Gavin on September 30th here: Seeing Night Reviews. Check out Descended by Blood (Vampire Born #1) details on Goodreads. Donna's Thoughts: I have to say I love it. The book cover for Angeline's first book was what got my attention first time around, so now for book 2, I think it's a fantastic addition. I love the style of the writing and the slight pattern in the corner and I love the colours. I have to say, I'd love to see Mirko on the cover too...maybe the next one Angeline? lol. We need to see Mirko!!! We LOVE him. You know I first rated this book a four after finishing it but something didn’t sit right with me about just giving it a four rating. So I changed it to 4.5 and now, while I’m writing this review I still don’t think that’s enough. So yep now I’m rating it 5 and here’s why. 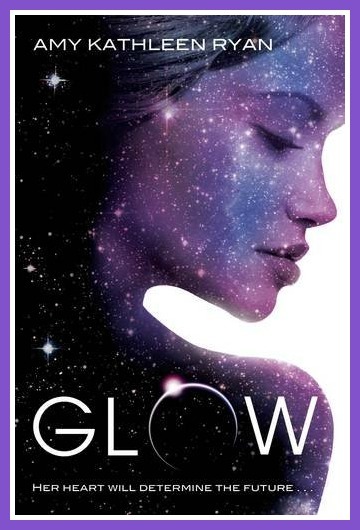 The story follows Nara Collins, a sixteen year old girl, who dreams the events of the following day…..every night. Knowing what will happen the next day does have its advances, especially when Nara can aces tests and save every goal for her Soccer team. But things soon turn nasty when Nara prevents a bombing at her High School, she loses her ability to see the future and people at school are suddenly being injured. When Nara comes across Ethan, the school loner and outcast, Nara can’t help feel drawn to him especially with him being the only person who seems to understand her. As Nara and Ethan develop a friendship, sparks soon start flying but what they’re not prepared for, is the danger that is a suddenly surrounding them due to the connection they have. Soon they find out that Fate is real and can they stop people getting hurt without getting hurt in the process? Can I just say I loved this book? Wow! It’s one of them books that are completely compelling from start to finish and even now I’ve finished it, I need more! 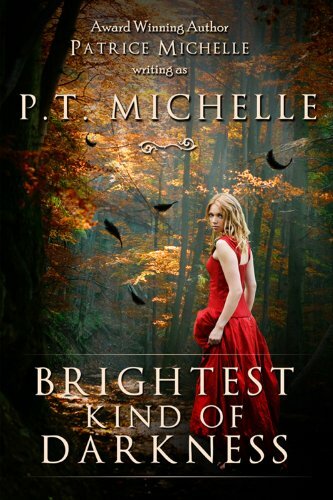 P.T Michelle certainly knows how to pack a thrilling and dangerous ride, one that gave me the chills and totally turned me into a bundle of nerves while reading it. Brightest Kind of Darkness is a unique story with no Vampires, Werewolves or Faeries in sight; the whole idea of trying to beat Fate is truly freshing and exciting. You honestly don’t know what will happen next, your left guessing and trying to figure things out but you can’t because P.T Michelle throws a few spanners in the works that leaves this story totally unpredictable. The characters are fantastic. Nara is a down to earth girl that is easy to love. She’s positive and strong and even though things are totally crazy in her life, she still manages to do the right thing by doing what she believes in. There were times I also felt for her. Her father left her and her mother at a very young age and that has clearly affected her. Now Ethan, I adore Ethan. 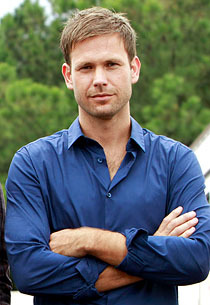 Seriously, I want to marry him. He comes across as a trouble teen but as soon as Nara starts to get to know him, you see that it’s all a front. He’s a deep, loveable character and totally swoon worthy. I loved watching his and Nara’s relationship develop. It wasn’t rushed or forced but it felt natural and at a steady pace and the suspense between these two…oh my! Let’s just say I had a few butterflies in my stomach a few times especially when Ethan’s feelings for Nara showed, I loved how honest he was. Yep….he’s a total winner. The mystery that surrounds the story will definitely keep you on your toes. Just when you think you’ve finally got some answers, more questions appear and I am dying to know what will happen next. I’m going to assume Nara’s father will make an appearance in Book Two, well I hope so. I have a feeling he’s going to shed us some answers, either that or reveal a few startling secrets. Either way I’m looking forward to it. Overall, Brightest Kind of Darkness is a fresh, thrilling and compelling read. It’s almost got a Final Destination feel to the book but P.T does make this book her own. I can’t help but ask myself, why isn’t this book been picked up by a publisher? Publishers…..seriously you’re missing out. I so want this book sitting on my shelf and I for one am thankful this book was bought to my attention because like I said, it’s not one you want to miss out on. Thank You to P.T Michelle for giving me the opportunity to review this book. JACK THE RIPPER FAN WALK. This is an amazing opportunity for fans to meet Maureen Johnson, author of Little Blue Envelopes and The Name of Star, coming out tomorrow! The prize is to come and join us as we undertake a walk through Jack the Ripper’s old haunts on the official tour in East London – and the winners can bring a friend! 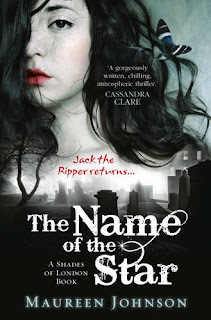 To celebrate the publication of Maureen Johnsons new YA thriller The Name of the Star, HarperCollins Children’s Books is offering 10 lucky readers the opportunity to accompany Maureen Johnson on a private Jack the Ripper walk in London on Thursday, 13th October 2011. The walk begins at 5:00 PM and will carry-on for two hours into the night! Visit the haunting sites of Jack the Ripper and hear first-hand from Maureen how they inspired her new book The Name of the Star. To enter, simply email nameofthestar@harpercollins.co.uk for a chance to attend the event with a friend. Entrants must be 13 or over. Please ensure that you are available to attend the event on Thursday, 13th October from 5.00pm to 7.00pm before entering. Winner will be informed on Friday, 7th October, and will be provided with further instructions then. *Book Passion for Life are not responsible for this competition. The competition is run by HarperCollins UK. So to celebrate the release day for Laini Taylor's new book Daughter of Smoke and Bone, we are giving away to one lucky UK or Ireland winner a hardback copy of Daughter of Smoke and Bone. Jess has read this book and definitely thinks you all should too! So if you'd like to be in with a chance of winning just fill out this FORM. There are extra entries, but these are not needed to win. * UK & Ireland entries ONLY! * Winner will also be notified by email, and will have 48 hours to reply other wise a new winner will be chosen. 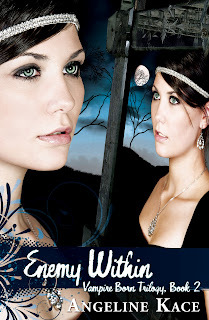 The Blurb from Goodreads: ROSE Frost receives a bracelet on her sixteenth birthday, a parting gift from her mother who claims it is a family heirloom. From that night Rose starts having vivid dreams and strange visions. DAYS after, her family separate and Rose moves into her grandmother's house. Her dreams start to involve a woman called Halíka Dacomé. Is she a legend or a figment of her imagination? The Review: Before I start the review, I just want to take time to say….WOW, look at that cover. The cover is probably one of the best Indie book covers I’ve seen. I love the colours and I think it’s beautifully simple but it’s also very intriguing too. I’d love to see this book sitting on my bookshelf. Yeah so as you can tell, I love it. Now for the review. 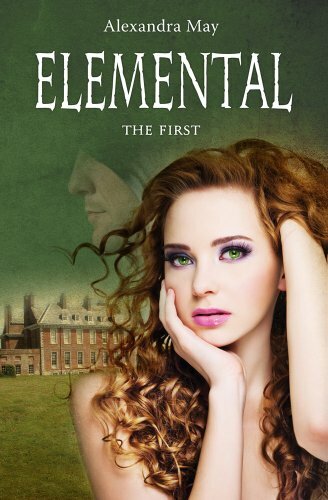 Elemental: The First is book that surprised me. It surprised by how much I enjoyed it and now I’m more than eager to get my hands on the next book. The book follows Rose-Marie, a young girl who is moving to her grandmother’s house so she can study for her final year in school. On her sixteenth birthday, Rose’s mother gives her a bracelet that has been in her family for generations. After receiving the bracelet, Rose starts getting weird dreams that she can’t explain. What she doesn’t realise is that she is tied to a young women called Halíka Dacomé. But how can she be tied to this women when surely, she is just a legend? From page one your sucked straight into the world that Alexandra has created and you’re captivated from the start. 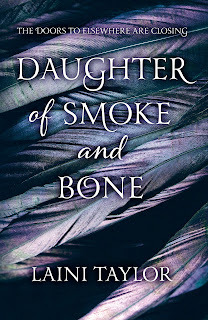 There a good mix of mystery, romance and suspense to the story but it also had great characters too, so all of them things made this book really enjoyable. The mystery that surrounds the book is one I really enjoyed too; I found that I was trying to predict everything that happened in the book, only to find out that I couldn’t predict anything. Alexandra definitely keeps you on your toes and it was definitely one that will keep you excited. The romance in the book for me was huge factor. I love romance and I really enjoyed it. Although you don’t see much in that department until you’re about half way through, the relationship Rose has with both Morgan & Aiden were completely different. She feels a deep connection with both boys but as I said, both are very different. With Morgan, it was instant. Rose felt like she had a friend in him as a well as very developed feelings but I found myself getting quite frustrated with them two as a couple. I’ll be honest; I didn’t like it because I’m totally TEAM AIDEN!!! With Aiden, Rose felt like that was where she belonged. 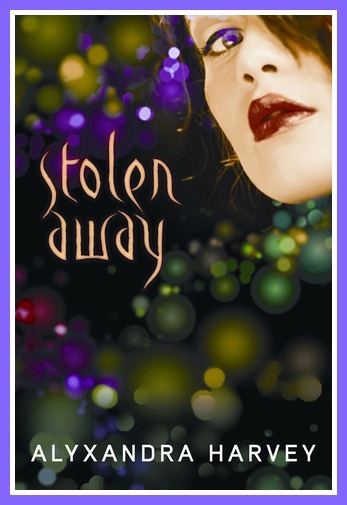 That Aiden was her long lost love and although Rose and Aiden’s relationship doesn’t develop as much as I would have liked in this story, it does give me hope to the next book. So yeah Team Aiden all the way. The story had a good flow to it, easy to follow and not to confusing. The story surrounding Rose and Halíka Dacomé was very intriguing but I have to say, I really wish Rose had found out more information than she did in this book. I know Alexandra has set the book up nicely for book two and even with that huge cliff-hanger, I just wish Rose had known more so we could see how she feels about everything and it wasn’t left so late. But hey, I guess that’s why there’s book two. Overall, Elemental: The First is not one to be missed out on. Awesome characters, thrilling plot and very intense relationships….what’s not to like? Buy it guys! 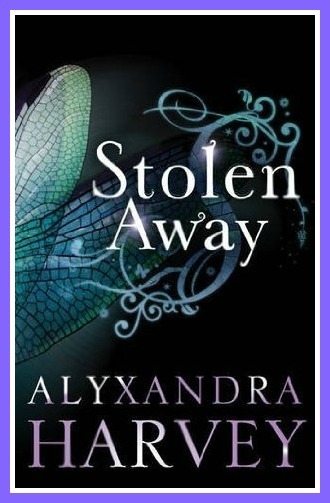 Thank you to Alexandra May for giving me the opportunity to review this book. 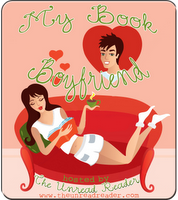 My Book Boyfriend is a weekly meme, hosted by Missie at The Unread Reader. What is My Book Boyfriend you might ask. 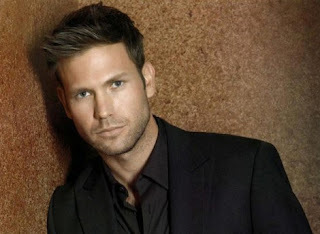 Well it is a weekly meme where we talk about a literary crush including stats, a picture of what you imagine he looks like and some quotes from him that make you swoon. If you are interested in participating please check out the My Book Boyfriend Introduction Page over at Missie's blog The Unread Reader. 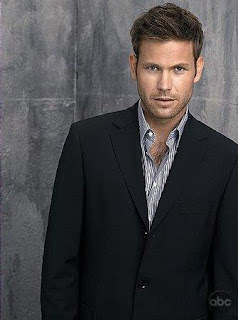 For this weeks Book Boyfriend I've picked no-one immortal, no-one overly special, he's just a regular all round interesting guy...Seth Mortensen of the Georgina Kincaid series. Description: He's cute, in a dishevelled sort of way. 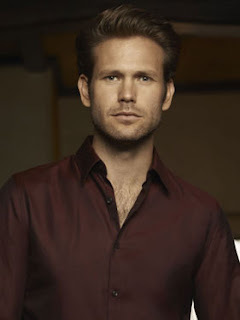 He has brown hair with a reddish gold gleam to it. In the shadow you can make out facial hair crossing his lower face. "I don't care," said Seth. "I would have done it. I would have sold my soul for you. You and me...I told you. Something's always going to keep us near each other...even if we aren't together." “Jesus," I said. "That was bad." Seth looked startled—and then hurt. "Bad?" "No, not performance bad—more like dirty, wicked bad. The kind of stuff that gets an R rating." "What, we can't do that?" He stepped forward and wrapped his arms around my waist, nuzzling my neck. "Well, yeah...er, well, damn it. We're not supposed to be. Not at all. It's just that last time, it was like...I don't know. It was making love. This time it was..."
YIKES! Sorry about the R-rated final quote...but it was just to prove my point that even though Seth is a total geek and awkward he can be all animal and stuff too! There you have it. Matt Davis is my Seth Mortensen. He's cute whilst still being handsome and having a geeky chic look to him. Plus he has that 5 o'clock shadow that Seth has too. If you'd like some geeky chic (whilst being quite *sexual growl* later on) you can catch Seth in all 6 books of the Georgina Kincaid series by Richelle Mead...if you haven't already read them well I should slap you! Go read them! Go little minions go! 1) "Then I saw her face. She looked ready to cry again. Aw, man, I was a jerk. Here I was ready to do a touchdown dance, and she looked like someone had just killed her dog." 2) "Cocky? Look who's talking. Miss Nothing-but-a-t-shirt-and-Attitude." 1) " This is going to sound crazy, but......from the moment I first set eyes on you I haven't been able to stop thinking about you. " 2) "Adam, ant chances you would sod off for a while? Megan can't keep her eyes off you for less than ten minutes, and it's interfering with her training. It's also making me feel like I'm going to puke." What's your Teaser Tuesday today? Leave us your links below. Welcome to Book Passion for Life's 25th US vs UK book cover battle. We've seen this posted on a few other blogs, and thought we'd jump on the band wagon! The idea of this battle is once a week we'll post 2 sets of books of our choice, one US cover and one UK cover, and we'll just give our opinion on which one we love the most. Which cover captures the story, which one would catch our eye if we saw it on the shelf in a shop. The US cover will be on the left, and the UK cover will be on the right. Jess says: These are both beautiful covers. But I think I prefer the US cover more. It's just simpler, there's less going on it the cover art which I like. The UK cover is pretty; and I would pick it up but I definitely prefer the US cover more. Donna says: This is a bit of a hard one for me because I honestly really like both covers. However, I think the US wins slightly. I really like the UK cover but I'm not a 100% on the women on the cover. Her features look slightly weird, the nose, the eyebrows, the mouth....almost unrealistic. I love the US cover because even though it's plan, the style of fonts and the women in the O looks really pretty. Jess says: UK! Definitely the UK it's just a lot prettier and I prefer all the blue/turquoise colour against the plain black. It's just a lot more prettier than the US cover. Donna says: Oohhh I have to say the UK. Look how much prettier is it? I'm not to sure on the colours on the US but the UK is beautiful. The patterns and I love that we see the wings with all the details on there. I'm actually pretty excited about reading this book too. Battle of Sexes: Girls Winner!